Once again, the nation’s leading professional hate group, the Southern Poverty Law Center, has come under fire, this time for unfounded smear jobs against a number of legitimate journalists. The hate-monger retracted its accusatory article. The Southern Poverty Law Center (SPLC), an insidious, subversive, anti-free-speech organization masquerading as a legitimate human rights group, is under fire for once again smearing a number of legitimate, professional journalists as “fascists” and “racists” colluding with the Russian government to promote such views. In a now-redacted article, originally published March 9 under the headline “The multipolar spin: how fascists operationalize left-wing resentment,” the SPLC attempted to portray a number of anti-war, progressive journalists—including Max Blumenthal, a Jewish journalist critical of the Israeli regime and its brutal occupation of Palestine—as pawns of right wingers and a broader campaign involving Russian President Vladimir Putin and the Russian regime. Following publication of the article, written by Portland State University lecturer Alexander Reid Ross, Blumenthal and others expressed outrage that they were being falsely portrayed as stooges of the “alt-right” and the Russians. Roughly one week after the article was published, the SPLC took the piece down and replaced it with an apology note attempting to clarify the purpose of the report. The SPLC went on to apologize to the journalists and researchers they smeared, including Blumenthal, Ben Norton, Tim Pool, Rania Khalek, and Brian Becker. 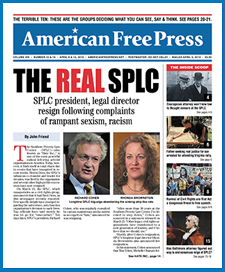 The latest controversy involving the SPLC comes at a time when the treacherous, un-American organization has been revealed to be a part of YouTube and other top Internet and social media companies’ “Trusted Flaggers” team, which polices YouTube, Google, Facebook, and other platforms for “hate speech” and “racism” by “flagging” content for removal and censorship. Given the SPLC’s clearly blatant bias against conservatives and traditionalists, many are calling for an end to their close relationship with YouTube and other Internet giants. become jew-wise!, see how the jew world order is a psychopathic plot to enslave humanity. all of us goy are in the same boat as the palestinians! find out how the jews regard the rest of humanity; see what their plans are for creating the jewish paradise. The $PLC? Just follow the money. Eventually, as all evil things do, you will find many members of (((the tribe))) at the center of this.